Soap has evolved a lot since it was introduced to the market. It comes in many different shapes, sizes, fragrances, and colors. Different soaps are made for different purposes, but they all are meant to keep us clean. Body wash does most of the heavy-lifting during our bathing. While shampoo and conditioner only have to clean our hair, body wash is left with taking care of the rest of our body. Who better to entrust our hygiene than a company that has been around more than 120 years? When I think of any soap, Dial immediately comes to mind. 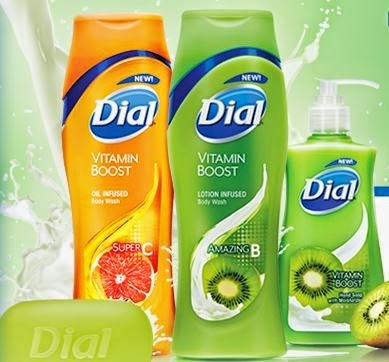 From bars to body wash, Dial has you covered. Their new vitamin boost body wash really takes things to the next level. I recently had the chance to review a lovely scent of the Dial Vitamin Boost body wash brand, the Amazing B complex. The scent of the Amazing B complex is kiwi, a fragrance that I love. The citrusy aroma fills the shower, allowing for a feeling of vigor, while the B complex rejuvenates your skin and pores, revitalizing and nurturing your body. The Dial Vitamin Boost brand body wash cleans your body well, with exceptional lather and a great aroma, but it does more than just clean. Reinforced with vitamins, this body wash is also good for your skin. This is a sophisticated body wash that is a result of Dial’s more than 100 years of experience and dedication to making great soap. Where to purchase: You are able to make a purchase from local retailers in your area.